of seeing delicious Central New York-made foods in gourmet stores in New York City. Located in Park Slope, BKLYN Larder is a beautiful, Slow Food-approved market filled with cheeses, charcuterie, meats (can you say, heritage Berkshire pork belly!) spices, chocolates, dairy products, and prepared foods. Amidst all of this deliciousness I found yogurt and milled flours bearing the 315 or 607 area codes. Love that. This small shop is definitely worth a visit if you find yourself in Brooklyn. Until then, let's rejoice that we can get some of these great foodstuffs in our own backyard--with perhaps more options on the way. My latest obsession of trying to learn how to make good espresso has led me back to one of my oldest obsessions since moving to Syracuse--getting Gimme! Coffee. Some of my first posts on this blog back in 2005 were about the brief venture Gimme! made by setting up a booth at the CNY Regional Market and my emails to CEO Kevin Cuddeback to open up a cafe here in the 'Cuse have gone unanswered. But that's okay now. Sugar Pearl over in Hawley-Green and Second Story Cafe on Westcott Street both serve Gimme! Coffee and they also sell their freshly roasted beans. This is good news to me and to anyone who likes the option of enjoying their brewed goodness in the comfort of their pajamas. I love hanging out in our local cafes but sometimes, you know, there are days. And why is this such a big deal to me--especially with beans being roasted and brewed right here in Syracuse and Fayetteville? Well, when one of the most heralded coffee roasters in the United States is regionally roasted (Trumansburg) and locally available we ought to be celebrating that left, right and center. 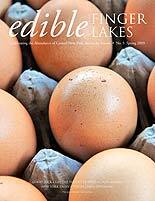 Check out the winter issue of Edible Finger Lakes to read about John Gant--the roaster who helped make Gimme! great. Truly, if you are into excellent, micro-roasted coffee, the 'Cuse is the place to be. Note: The espresso machine in the photo is NOT what I'm trying to pull shots on--this beauty sits in the cupping room at the Gimme! headquarters.